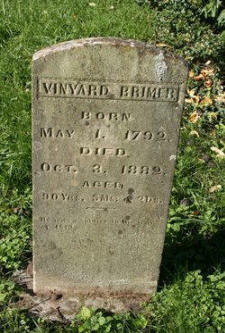 NOTE: 1795: Son William S. Brimer was born 1795; died 1883. Married Hannah Venable 11 Nov 1824 and 5 years later married 2d wife Mrs. Polly South on 15 Jan 1829 and 8 years later married 3d wife Lavinia Finley 5 Apr 1838. William S. Brimer has a separate webpage. CLICK HERE. NOTE: 1785: Son John Brimer b. Haywood County, NC; m. Sarah "Sally" Parrotte in Jefferson County, TN on 9 June 1812. Died Nov 1844. One daughter was Barbary Brimer who married John Birchfield. One son was Vineyard Rhoten "Rip" Brimer b. 4 Aug. 1821 d. 20 Aug. 1898 in Dandridge, Jefferson, TN and m. Rhoda Miller 1845 in Jefferson. John Brimer has a separate webpage. CLICK HERE. John Brimer has a separate webpage. CLICK HERE. 1787: Son James R. Brimer born in Rutherford County, NC; d. 3 Oct 1882 in Jefferson, TN at age 95. Since there is no record found to date of any marriage, children, etc., it is possible that this information is incorrect. 1792 May 1: Son Vineyard Rhoten Brimer born on May Day in Haywood County, NC; died October 3, 1882 in Jefferson County, TN at the age of 90. Married (1) Barbara Lemmons (Layman) on 5 Aug 1813 in Jefferson County per Dodd, Jordan. Tennessee Marriages to 1825. Married (2) Phalby Hall January 7, 1861. Served in War of 1812 (Service Pension Pg: Widow of War of 1812 Certificate #33079, National Archives; Text: From Falby Hall Brimer for Vinyard's service in the War of 1812). Buried at Brimer Cemetery in Karns, Knox County, TN. He lived in Hickory Ridge per US Gen Web. When Vineyard was a soldier in the War of 1812, it earned him the ability to claim 50 acres of military bounty land in Missouri territory. But he was deeply entrenched into Jefferson County, TN. So apparently, what he did was apply for and get the land, then turned right around and either gave or sold it to another person, who went on to Missouri. 1793: Daughter Tabitha or Sabath Brimer, born about 1793 in Haywood County, NC; died 1864. She married in 1834 to George Rogers. 1795: Son William S. Brimer born about 1795 in Haywood County, NC. He died on 17 Mar 1883. William S. Brimer has a separate webpage. CLICK HERE. 1796: Nancy Brimer. No other information known. Could she be a twin of Barbara Mary Sabra Brimer? 1796: Daughter Barbara Mary "Sabra" Brimer, born 1796. The 1850 and 1860 censuses lists her in Sevier County, TN. She married a John T. Newman in Sevier, TN in 1813 and had 9 children, Rhoda, David, Rebecca Jane, Mary Ann...Thomas Newman. She died in 1870.